Various images of air race in California, ca. 1950-1964. 1N: Group portrait of six men and a woman in front of biplane with sign, "Pilot Albert Kushihashi, North Platte, Nebe." 2N: Viewer looks through open door of biplane at Kushihashi in shirt and bow tie in pilot seat next to Caucasian man with same woman sitting in back with luggage on her lap and behind her. 3N: Caucasian man speaks into a microphone next to a table covered with airplane trophies on a grandstands decorated with stars and stripes bunting and two American flags flying at back. Two boys in foreground and Caucasian and Asian men and women sit on stage. 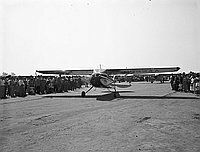 4N: Biplane taking off on dirt runway lined with spectators. Another biplane in background. 5N: Man waves as he sits in cockpit of small Mooney plane. His eyes are shut. 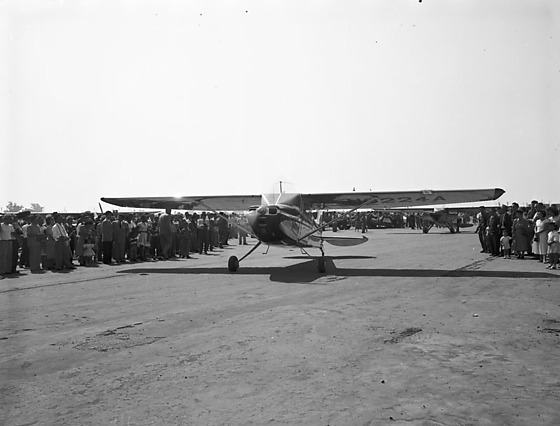 Typed on original envelope: Henry Ohye -- Air Race Take Off.